This letter is pronounced Kaph - meaning a spoon or the hollow of one's hand - receptive symbols, and therefore feminine. It is attributed to Jupiter, and as it connects Chesed (the sphere of Jupiter) to Netzach, which latter is the sphere of Venus, the Path of Kaph partakes both of the magnanimous and generous expansive character of Jupiter, and the love nature of Venus. 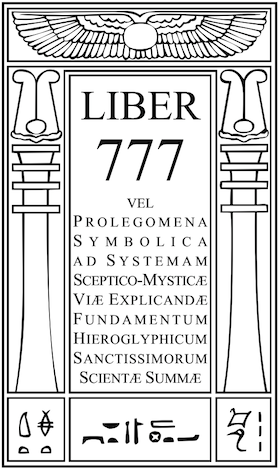 It repeats on a considerably lower plane the attributions of Jupiter, Zeus, Brahma, and Indra, already commented upon. Pluto is also attributed, since he is the blind giver of wealth, symbolical of the infinite and abundant prodigality of Nature. In the Northern Sagas we find that it is Njord who rules over the winds and storms, and checks the fury of the sea and fire; he is, moreover, the guardian of wealth and gives possessions to those who call upon him. Kaph is entitled "The Conciliatory Intelligence "; its jewels are Lapiz Lazuli and Amethyst; plants Hyssop and Oak; perfume Saffron and all other generous odours, and its colour Blue. 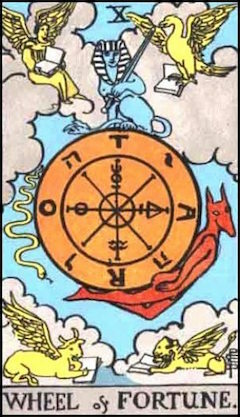 The Tarot card is X -The Wheel of Fortune, which, in some packs, is a wheel of seven spokes, with a figure of Anubis on one side bearing a caduceus, and on the other a demon with a trident. On the top of the circumference is a Sphinx bearing a sword. The wheel represents the ever-whirling Karmic cycle of Samsara, of existence after existence, at one moment elevating us above princes and the kings of the land, and at others throwing us below the level of slaves and the dust of the earth. On the wheel, at each of the cardinal points, are inscribed the letters TARO, and in between them the four Hebrew letters of Tetragrammaton. At each of the four corners of the card, seated on a cloud, is one of the creatures seen in vision by the prophet Ezekiel. Power of Acquiring Political and other Ascendency. The Lord of the Forces of Life.